I love making hamburgers at home. Not those preformed, flavorless (sometimes frozen) hamburgers, but real hand formed burgers. 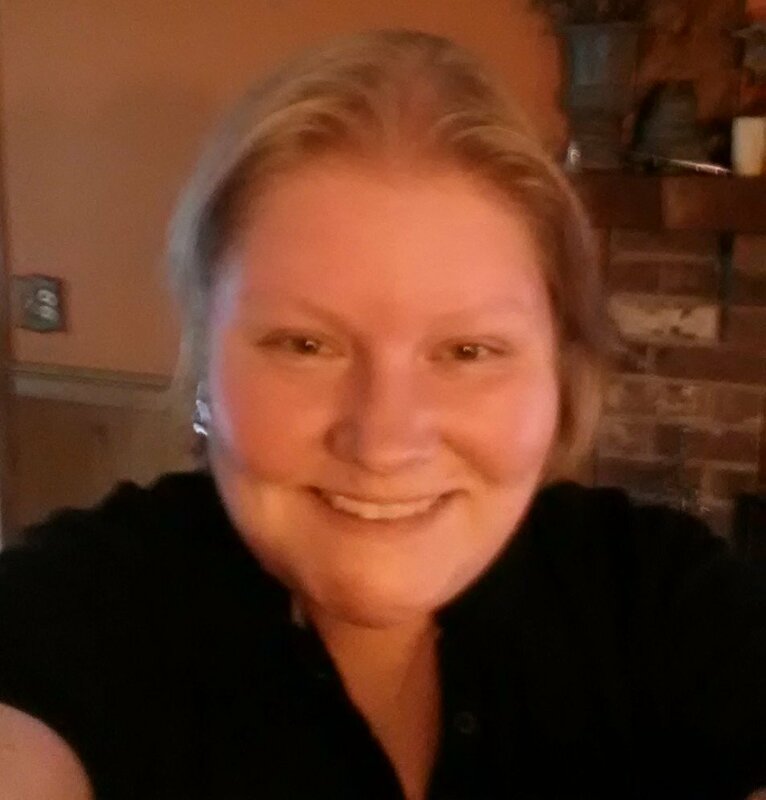 Tonight, I needed a quick meal I could get on the table fast because I had a meeting to go to. Hamburgers won. 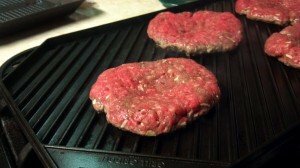 Making your own awesome hamburgers at home is easy. First, start with good ground beef. Tonight, I was using 90% naked (no hormones, no antibiotics) beef. The reason I’m willing to spend a bit more is because I want really good beef flavor in my burgers. Going out to get burgers is going to cost you at least $5.00 per burger, even if you go to McDonald’s. And my quarter pounders are WAY better than McDonald’s. Cost for the meat was $3.00. 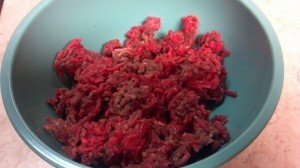 For each burger, crumble a quarter pound of beef in a bowl. For each burger add a a quarter teaspoon of salt, pepper, garlic powder and dried minced onion. I like using dried minced onion because it soaks up the beef juices and adds awesome flavor. I’ve experimented with all types of seasoning mixes and this is the one that my husband and I like the best. Now, take off your rings and wash your hands, because we are going in with both hands! Lightly mix the spices into the meat then divide the mixture into quarter pound servings. Roll each serving into a ball and then start to flatten it. Use the palm of your hand to flatten the ball against your other hand. I make my hamburgers thin because they will shrink and fatten up as you cook them. I hold the patty with two hands and use my thumb to shape the patty into a kinda-sorta round shape. You don’t want the edges to be too much thinner than the center or else the edges will be dry by the time the center is done. Once they are shaped, use your index and middle fingers to put a divot in the center of the burger. 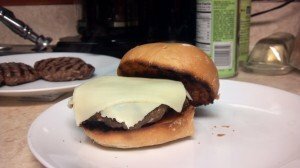 Have you ever made burgers that looked like they were pregnant? The divot keeps the budget from bulging up in the center. In the picture below, you can see the little divot in the patty. Don’t make it too deep or your burger will have a crater. There are a number of ways you can cook your burger. I’m using my trusty griddle/grill pan. I love this thing. I got it for $20 at Target. It’s flat on one side (great for pancakes) and has ridges on the other (great for grilling just about anything). I use this pan at least three times a week. If you don’t have a griddle pan, you can use a regular frying pan or grill them outside. 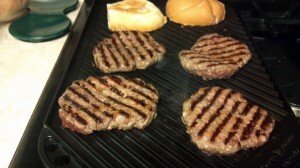 I use medium high heat to heat the pan (between 7 and 8 on my gas stove) to heat the pan for a good five minutes before placing the burgers on the pan. You want a hot pan or else the burgers will stick. You are looking for searing and you should hear sizzle when you put them down. Cook the burgers on one side for about 4 minutes or until you see that they look cooked about halfway up the side. Flip the burgers. If they are sticking to the pan, they aren’t ready to be flipped yet. Don’t force them. You’ll rip your pretty little burgers. Aren’t the grill marks pretty? They are delicious, too. At this point, I sprayed my bun with a bit of cooking spray (you can use spray butter or brush with olive oil instead) and placed it on the grill. Jeff doesn’t like grilled buns. Cook the burgers a few minutes longer until they are done to your liking. I’m terrible at getting them to the right temperature for the perfect medium or medium rare burger without using a thermometer. I cook them til the juices run clear if I don’t have a thermometer. If you use good beef, they will still be juicy even if they are medium well. If you like your cheese a bit melted place cheese on the burgers about 30 seconds before you take them off the grill. I like my cheese a bit melted but Jeff just puts his cheese on the bun. Don’t be stingy with the cheese! This was my burger with grilled bun and melted cheese. I like mayo and ketchup on my burger. Jeff likes yellow mustard on his. Did I mention he also likes yellow cheese? Yes, we buy white and yellow American cheese in our house. We are strange folks. This dinner took me about 15 minutes to make from start to finish. Serve it up with some veggie sticks or some potato salad and you’ve got a great dinner that was a lot less expensive than a trip to the drive-thru and so much more delicious.